In the unlikely little town of Catskill, NY, located on the Hudson River 100 miles north of New York City, Allied Yachts was founded in 1962. The company’s first entry into the recreational boating market was the 30’ 6", Thomas Gillmer-designed, Seawind. Later, Apogee, a Seawind skippered by Scarsdale, NY sailor Alan Eddy, would become the first fiberglass yacht to circumnavigate the world. This was an accomplishment that did much to belay skepticism over the suitability of fiberglass for yacht construction, and firmly established Allied’s reputation for building solidly constructed, seaworthy yachts capable of cruising the oceans of the world. Despite its reputation and success, the Seawind had minimal accommodations that were, at best, cramped for any sailing family. In the mid-1970s, Allied again called on Gillmer to design the Seawind’s successor, and in 1975 the Seawind II was introduced. The length of 31’ 7" was only slightly longer (4%) than the original Seawind but length alone can be a poor indicator of size. The Seawind II has a beam of 10’ 5" and a displacement of 14,900 pounds which, respectively, is 13% and 23% greater than her predecessor and provides considerably greater interior volume. The increased volume allows substantially improved accommodations. The slight increase in overall length allows a more balanced appearance which, to my eye, results in a much more handsome yacht. None of the original Seawind’s structural integrity and strength was sacrificed in the new design. The hull is hand-laid fiberglass materials and resin. The lay-up is substantial and well supported by full and partial bulkheads attached by secondary bonds of cloth and resin. Attachments are neat, strong, and not likely to fail under even the most adverse conditions. The method Allied used to attach the hull and deck is exceptionally strong. An outward turning flange on both deck and hull are bolted together using a marine adhesive between. When complete, the flange is covered with a heavy aluminum extrusion. In addition, the inside joint is reinforced with fiberglass and resin. The decks and cabin are a composite of fiberglass resin and balsa wood core. Ballast is an internal lead casting glassed into the keel, and hardware is all through-bolted with backing plates for good distribution of loads. The mast is deck stepped and supported from below by a substantial wood compression frame that extends into the bilge. The Seawind II was powered by a four-cylinder Westerbeke diesel engine. Although this is generally a good dependable engine with plenty of horsepower for the displacement, the location of the engine gives owners and service mechanics fits. The engine is crammed beneath the cockpit sole, and to gain side access requires removing all the gear and cover panels from the seat lockers. Below decks the arrangement is straightforward with a V-berth forward followed by the head and a hanging locker, asymmetrical port and starboard settees, and an aft galley. There is a table that drops down from the forward bulkhead. The one major fault I find with this interior is that there is no navigation station, which I would prefer to have on a serious cruising boat. On deck you may find getting about a bit cumbersome. The standard rig of the Seawind II is a ketch. This rig has its advantages off the wind and in heavy weather but the penalty to be paid on a 32’ boat is having the mizzen mast stepped forward of the helmsperson in the middle of the cockpit. This restricts the helmsperson’s vision and access to the main sheet. In addition it complicates moving about a cockpit area that is cluttered with a mizzen mast, mizzen shrouds and the main mast’s split backstay. A few Seawinds were rigged as cutters which, all things considered, would be my preference. In order to gain as much volume as possible below, the cabin house is wide and side decks are a bit tight. However, the lifelines are a good 6" higher than those on an average production sailboat and there is a substantial toe rail/bulwark that leaves you with a very secure feeling on deck. I must admit that I have not had an opportunity to sail the Seawind II often or long but the reported sailing characteristics seem to be a bit of an enigma. The displacement length ratio of 401 and sail area displacement ratio of 14.7 are representative of a heavy boat with a conservative sail plan. For comparison, the respective numbers for the Westsail 32, a boat with a rather well known reputation for mediocre performance, are 419 and 14.6. To the contrary and to the credit of Professor Gillmer, the Seawind II performs quite well when the apparent wind is above eight knots. Due to her long keel and rather dated rudder configuration, the Seawind II can be slow to tack, and good planning is advised in tight places. After several near brushes with death, Allied went out of business in 1982. To the best of my knowledge, about 120 Seawind IIs were built and many remained along the east coast. The Seawind II is one of only a few boats in this size and price range that I would consider suitable for bluewater passagemaking although most are likely to need a fair amount of updating of systems and rigging for safety and reliability. 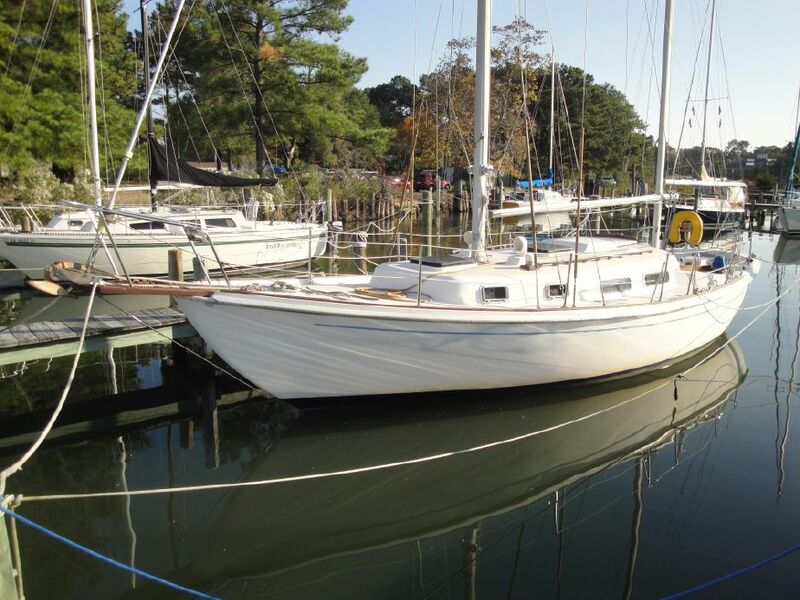 But, if a new Morris 32 or Pacific Seacraft 32 is a bit out of your budget, this could be just the ticket.